It’s been called “the worst infectious disease ever recorded among vertebrates.” The devastating effect of the chytrid fungus on frog populations around the world has contributed to the extinction of at least 200 species and no one knows where it came from. But now scientists are hoping to tweak the amphibian’s evolutionary development by bulking up their bods with small doses of the very thing that’s killing them. Batrachochytrium dendrobatidis has been wreaking havoc on frogs for 20 years now. The amphibian skin fungus causes the disease chytridiomycosis. When a frog is infected, its skin ceases to function properly. Because frogs breathe underwater and absorb key nutrients through their skin, a chytridiomycosis diagnosis is most certainly terminal. 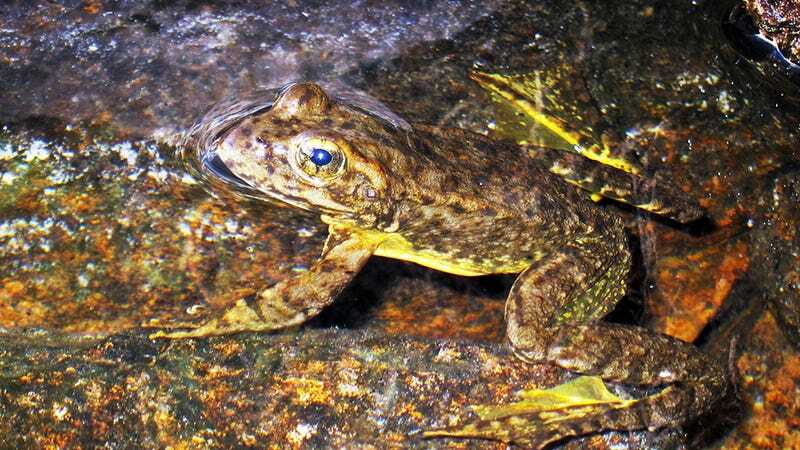 Last Summer, Federal biologists found dozens of the mountain yellow-legged frog dying and decided to attempt to save the species by collecting their young. The biologists then handed over the hundreds of tadpoles to Bushell’s team to start experimenting. Using a treatment that originated at UC Santa Barbara, the conservationists at the San Francisco Zoo began immunizing the young frogs with small amounts of the chytrid fungus in an attempt build up their immunity. “Their bodies identify it and can already be primed to fight off that infection, at least to keep it under control because they’ve seen it before,” she says. After infecting her test subjects, Bushell gives them an anti-fungal treatment that pulls them back from the brink of death. Once healthy, the frogs are released into the wild.